When Ellie's grandfather (a mad scientist-type) discovers the secret to staying young and turns himself into a teenage boy, her family suddenly finds itself with a unexpected house guest. Melvin looks like a teenage boy but dresses like Grandpa. He goes to school with Ellie, but grumbles about not being mentioned in the science textbooks. When he convinces Ellie and her new friend to help him steal his secret project from his lab, hilarity ensues. 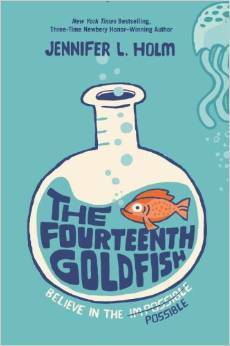 The Fourteenth Goldfish is yet another hilarious, action-packed middle grade novel that both boys and girls will enjoy. Along with the fun, this book also does a great job at introducing science to girls. As Ellie bonds with her grandpa, she learns about scientists like Salk, Oppenheimer and Marie Curie. She learns to use a microscope and think scientifically. She thinks critically about scientific discoveries in the past and eventually comes to a conclusion about how her grandpa's secret project might affect the world. I really appreciated how the book was essentially a metaphor for coming to terms with life and death, in a child-friendly way. Ellie has had thirteen pet goldfish die on her, her grandmother has died, her grandfather wishes to be immortal, and Ellie's relationship with her best friend is coming to an end. Little details that add to this theme also made this a book I could appreciate as an adult as well. I didn't really like the end, but I also don't know how else it could have ended. What do you do with a grandpa stuck in a fourteen-year-old's body? Does he find a way to age himself again? Does he start over as a teenager and correct his past mistakes? At least Ellie seems to have grown, and does the ending hint at a new beginning for her as well? The fourteenth Goldfish sounds so interesting. Great review. Thanks for the review! I'm always on the lookout for great MG titles, and the science tie-in is a definite plus! Glad you guys are interested in it! I didn't expect the science to tie in as much as it did, and it was a good surprise!